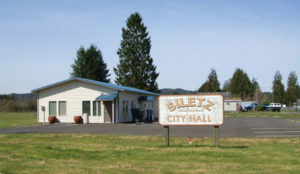 City of Siletz – "Fisherman’s Paradise"
The City of Siletz was incorporated in 1946. It is located on the Siletz River in the coast range mountains of Lincoln County, Oregon. It encompasses approximately four hundred acres and sits at an elevation of 130 feet. The city is approximately eight miles inland from the Pacific Ocean, thirteen miles northeast from the county seat of Newport and approximately seven miles north of Toledo. Our climate is moist, marine and temperate with precipitation ranging between 75 and 100 inches annually. Our vegetation consists primarily of Douglas Fir, Western Red Cedar, Sitka Spruce and Western Hemlock. Siletz has a wide range of public and private amenities and services usually found in much larger cities.